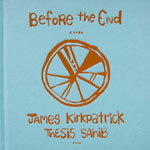 Thesis Sahib/James Kirkpatrick has been contributing to the underground hip hop movement for the past fifteen years, both as an innovative rapper and a well known graffiti artist. His articulate, rapid-fire delivery, harmonic vocals and imaginative lyrics have graced an impressive catalogue of sought after releases on CD and vinyl. His art and music incorporate sculpture, kinetic, and auditory elements. Often combining both 2D aesthetic with circuit-bent electronic toys, compositions written on modified Gameboys, a face mask costume fitted with a heavily effected microphone and circuit-bent sounds have become part of his music and on-stage performances. In recent years, James has combined his fine art practices with music both in the gallery setting as well as on stage. The best example of this would be his sound sculptures that can be seen in his latest release BEFORE THE END which is both a book of his fine art and a new 16 song album as Thesis Sahib. The blue 7-inch vinyl record that accompanies the book not only plays featured songs, but also the noises of the sound sculptures that are pictured in the book. The full BEFORE THE END album can be accessed through a download card in the book that can later be planted after use to grow wildflowers. Tracks 1-16 listed below are MP3 downloads; tracks 17-24 are on the 7-inch record.